Getting a business loan requires patience and dedication. One of the first things you should do is build a strong working relationship with the people who are likely to support a decision to lend to you. Find out who they are, and make sure they know you, for example, by asking for information about their products. These individuals will become your key contacts during the application process. 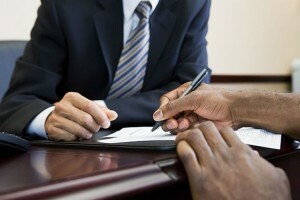 It is always important to remember that most lenders prefer doing business with people with whom they are acquainted. It isn’t unusual for a lender to refuse a loan request just because the applicant could not supply a good reason for taking on the debt. There are bad and good reasons for any type of loan. Good reasons are usually investments that can be shown to have a positive impact on your cash flow, and can include anything from buying an asset such as real estate or piece of equipment instead of leasing it, or developing software in order to improve business efficiency or access new markets. Asking for a loan to finance ongoing losses is likely to result in a denial. When you are ready to apply for the loan, you will need to make sure you have the proper paperwork in place to support your application. Along with the bank’s loan application form, you will need to supply the lender with a solid business plan, your resume, financial results, balance sheets and cash flow projections. You will also need to provide the lender with three years of tax returns and if you do not have these you can obtain them from the Internal Revenue Service (IRS). While most business owners try to keep their personal and business finances separate, the truth is that for most small businesses, there is no easy way of preventing the two from colliding. Lenders oftentimes like to factor in the personal finances of the business owner or owners, when a company is applying for a loan, and ask the owners to act as guarantors for the loan if the business is unable to repay it. Of course, the worse the credit histories of the owners are, the less likely the chances of receiving the funding. While it can take years and years to improve a damaged credit rating, there are some things that you can focus on in the meantime. Your credit score is made up of several different factors. Payment history covers around 35 percent, credit utilization makes up 30 percent, account mix accounts for 10 percent, credit inquires covers another 10 percent, and the final 15 percent comes from credit age. By paying your bills on time and using your line of credit for shorter periods of time, you can greatly increase your credit score, which will increase your chances of being approved for a loan. Most business owners aren’t aware that there are other sources of financing, including factoring and asset based type lending. Factoring is where a company sells its accounts receivable (money owned to it) in the present at a discount to future worth. The business receives about 80 percent of the total. Asset based lending is where lenders determine your eligibility by looking at your fixed asset, inventory value, and accounts receivable, rather than just considering your credit rating. A loan is backed by assets, which can be seized and sold in case of non-payment. How does asset-backed peer-to-peer lending work? A totally agree. A solid business plan that can be efficiently executed as well as produce a positive cash flow is a must.